Three stories high stands Delta Delta Delta's Theta Xi house on 834 W. 28th street. This mansion, known to us as the Delta Shelta, not only houses 65 girls each semester but also acts as a place where everyone can eat meals, study, watch TV, get ready for events together, and just hang out to make fun and lasting memories. The relationships made in this house are irreplaceable and there is never a dull moment here! One of the best things about our house is the food! Our chefs are always working away in the kitchen cooking up delicious and healthy meals open to all of our members. Every week day we are treated to breakfast, lunch, and dinner; and our chefs keep our ‘mini kitchen’ fully stocked with snacks. USC Greek life comes with many traditions, including two of our favorites: Monday Night Dinner where our chapter comes together for dinner every Monday night, and Friday Brunch where we can invite friends into our home and share our chefs’ talents with them. Originally built in 1897, the Tri Delta house is one of the few homes on the row that was originally built as a single-family residence. The Theta Xi House Corporation purchased it for Tri Delta in 1929 from the original owner, John H. Norton. Since then, House Corporation has worked vigorously to create warm and inviting spaces for our chapter members while being mindful of protecting many of the original architectural details. They also continuously update the house to meet all city and university safety guidelines. Our current House Corporation Board is made up of Tri Delta Alumnae from all across the nation who generously donate their time to maintain the chapter house, ensure its financial stability, and create a beautiful and safe home for its collegiate members in order to enhance the collegiate living and learning experience. 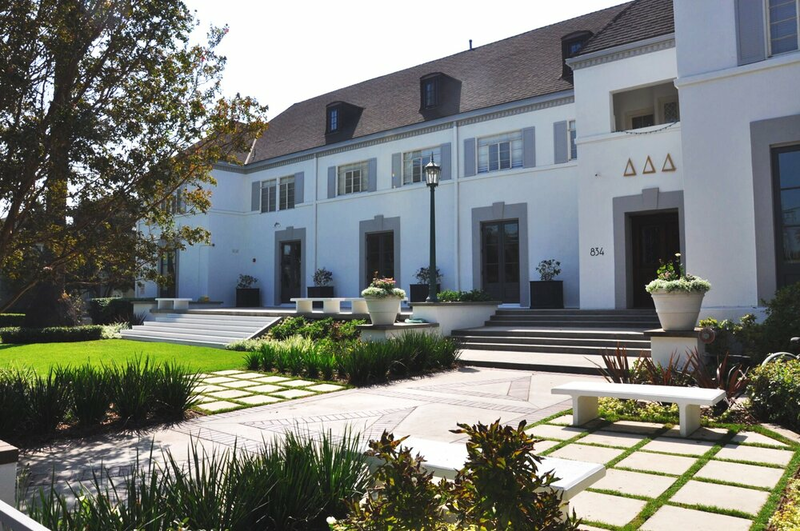 Lead by interior designer Meredith Green (Theta Xi, USC ’97), the board has plans to remodel a brand new kitchen, install new carpet, and redesign many of the interior spaces over the next couple of years. Our study room and gym were recently remodeled, and you can find Tri Deltas enjoying both at all hours of the day! If you have any questions regarding the house or interest in helping with some of their projects please contact Meredith Green at meredith@meredithgreendesigns.com.